Today I’m going to talk about color and ink. 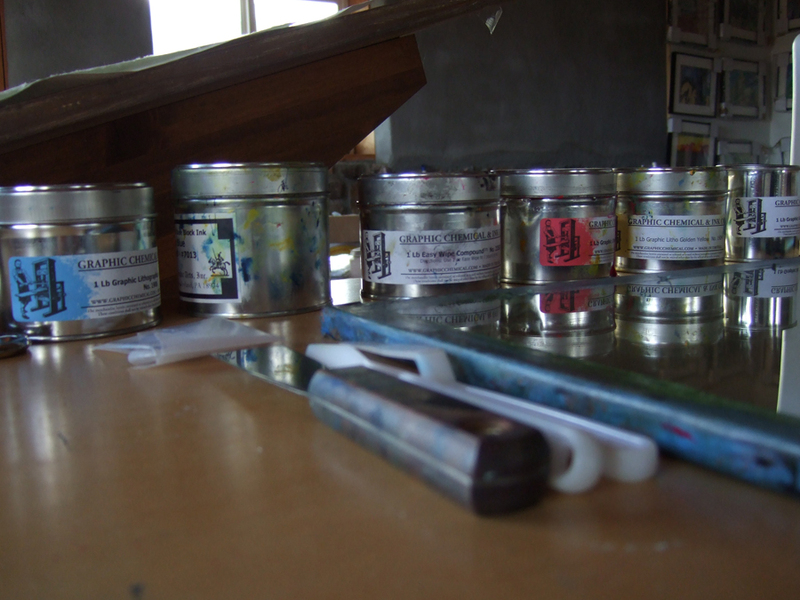 I use oil-based lithographic ink, but block printing ink works well, too. I like litho ink because it has a really nice, smooth texture. Etching ink is too coarse, so don’t use that. Oil-based ink has a beautiful lustrous quality to it that I feel gives the image a lot of depth. However, it does require cleanup with a solvent such as mineral spirits. I’ve never tried water-based ink, and in fact I’m not sure it would work out with reduction printing on woodblocks. The block has to be cleaned after each color printing, and I don’t think repeated cleanings with water would be good for a woodblock. Water-based ink would probably be fine with a linoleum block. As far as color, it is best to build up the layers from light to dark. The ink is not totally opaque, so underlying layers will impact the tone of colors printed on top of them. If you want a really bright yellow but you’ve already printed dark blue, you’re out of luck. 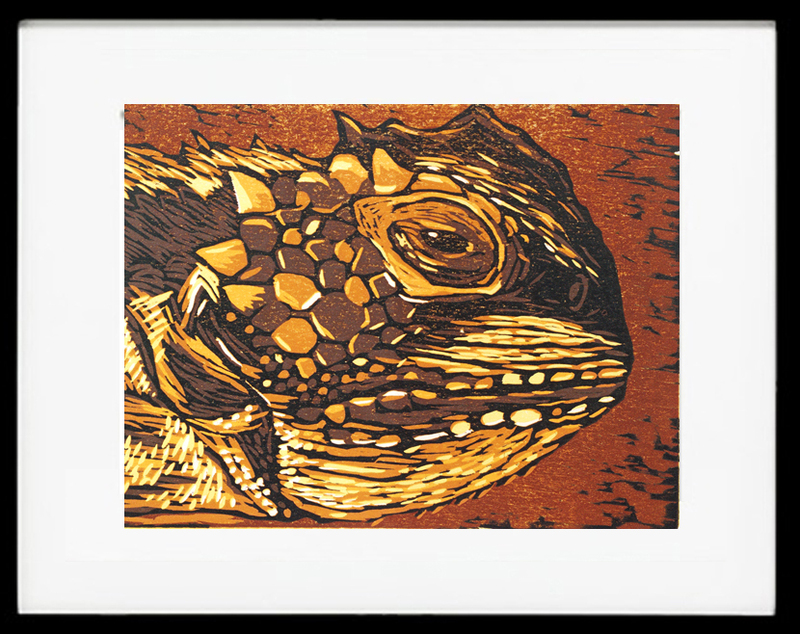 In this Horned Lizard print that I made at Stonetrigger in 2013, I printed the light yellow layers first, then orange, red, brown, and finally the darkest purple/black. I did a total of six colors–you may not be able to see them all unless you’re looking closely at the print. I often print layers of color that are very close in tone, for example first a bright yellow and then a slightly darker yellow. It’s subtle, but it helps to build up depth in the image, almost like shading with a pencil. When I start a print, I have a general idea of what colors I’m going to use, but it’s very, very general. Once I start printing and actually see how a color looks with what I’ve already printed, I often completely change course and make very different decisions than what I was thinking when I started. My biggest piece of advice for reduction printing is don’t try to plan it all out in advance. Trying to match an exact plan will drive you crazy, and you really can’t know how the colors will look together until they’re on the paper. Being willing to adjust as the image develops will make you much happier throughout the process. 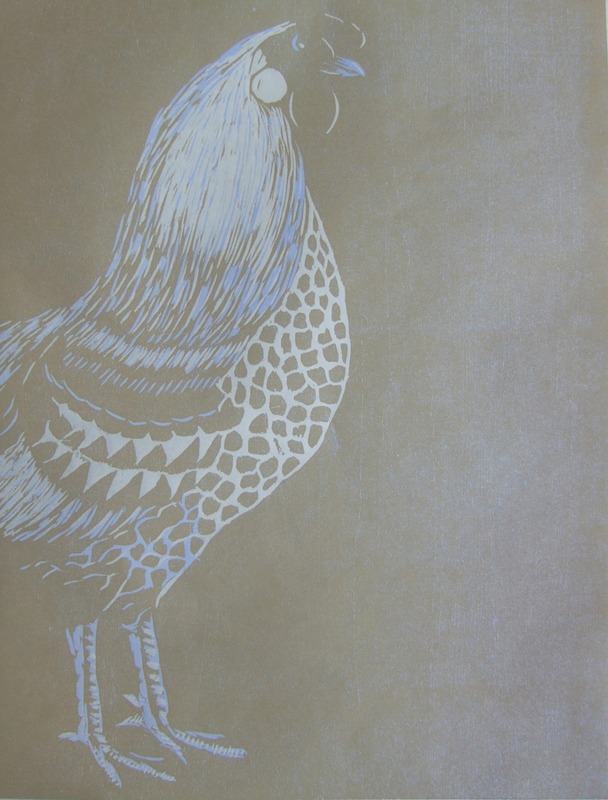 This is the third print I’m working on this week, a Silver-spangled Hamburg chicken. The first color was blue, second color a brownish gray. I hope to add four more colors, but at this point in the process I have no idea what they will be, except that they will get progressively darker. Stay tuned!